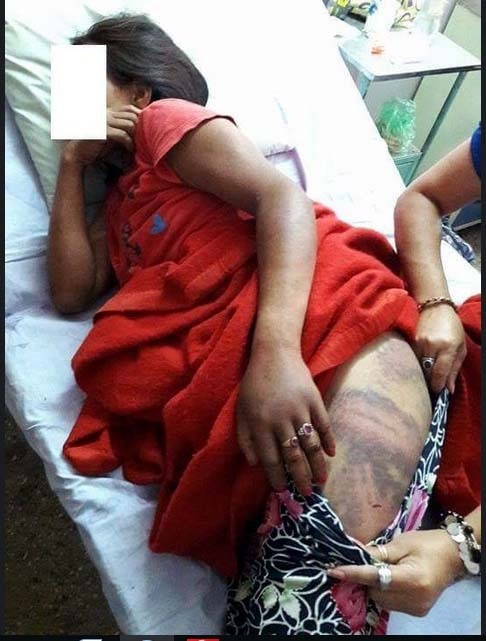 A woman from Sikkim who had come to Bijanbari here in search of a job was allegedly beaten up at the local police station where she had been sheltered by social workers on Sunday. The next day, the police took allegedly by police the next day<> where she is undergoing treatment. Sources said the woman, in her thirties, had injury marks on the thighs and hands. The woman has reportedly told some people at the hospital that she was beaten up by the " bara babu" of the police station as well. The officer in charge is usually referred to as " bara babu". Sharmila Pradhan, a social worker in Bijanbari, said: "When a couple of us were returning home after attending a meeting on Sunday evening, we saw a woman murmuring to herself on the road. We went up to her and asked her about her family. She told us that she was from Sikkim and her husband had eloped with another woman." Pradhan said: "The lady also told us that she had kept her son and daughter at her mother's house and she had come here looking for a job." Pradhan said the lady appeared "slightly drunk". "I think she was slightly drunk. We decided to call the police so that the woman could be in safe hands," she said. The social workers contacted the Bijanbari police station. "Soon, lady police personnel came and took the woman to the police station," Pradhan said. She added that she and her friends had also gone to the police station later in the evening. "I think some police personnel were handling the woman in a rough manner. We wanted to meet the officer in charge of the police station but could not. Since it was getting dark, we decided to go back home," Pradhan said. The next day, the woman was admitted to the hospital by the police for treatment. Pradhan and the others came to know about it yesterday and went to the hospital to check on the lady. "Injury marks could be seen on her thighs and her hands," Pradhan said. Doctors at Bijanbari hospital have refused to divulge any detail about the woman's condition. Darjeeling police superintendent Amit P. Javalgi said a probe was being conducted by the deputy superintendent of police. "An investigation has started. We have sought the woman's medical reports," he said. According to Javalgi, he was told that since it was late in the evening and raining heavily, the officer in charge of Bijanbari police station decided to keep the woman there on Sunday. Bijanbari is around 35km from here. "I have been told that after being informed by some activists, the police got the woman to the police station. But since it was late and raining, they decided to keep her at the police station with lady constables. The next morning, when they found that the woman needed treatment, she was sent to the hospital," Javalgi said. The chairperson of the Sikkim Women Commission today wrote to Javalgi raising concerns over the alleged custodial torture. The commission decided to write to the police officer after a photograph of the woman with bruises surfaced in the social media. "We have sent an email to the Darjeeling SP seeking the details of the incident. We are concerned and we hope that justice will be given to the victim, if it is really a case of police torture," said Rehna Rai, the commission chairperson. Sikkim West district SP Pratap Pradhan said the law enforcers were trying to locate the woman's family.